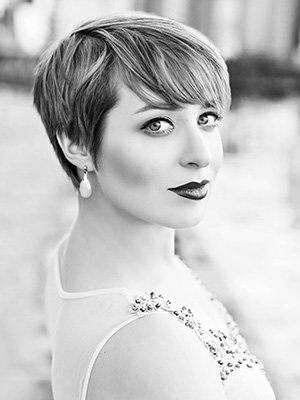 Soprano Fotina Naumenko is a versatile artist who enjoys performing a wide variety of vocal genres, including opera, oratorio, art song, musical theater, choral and contemporary music, both as a soloist and chamber musician. Recent concert highlights have included a program of medieval Marian hymns with the Caladrian Ensemble; the soprano solo in Bach’s Ascension Oratorio with the Cincinnati Chamber Orchestra and the Vocal Arts Ensemble; her solo debut with the Boston Pops in the symphonic premiere of the Broadway revue Sondheim on Sondheim; and a performance of David Lang’s just at the Tanglewood Festival of Contemporary Music that was hailed as “a beautiful performance” by the New York Times. In spring of 2018, Fotina completed a residency at the Indianapolis Opera, where she performed the roles of Sadie in Carlisle Floyd’s Slow Dusk and Carmen Ghia in P.D.Q. Bach’s The Stoned Guest. Fotina will return to the Tanglewood Festival as a Soprano Fellow in summer 2018. Fotina sings with several ensembles in addition to Conspirare, including Cincinnati’s Vocal Arts Ensemble, and Coro Volante, a vocal group dedicated to the performance and recording of music by living composers. In 2014-2015, she completed a Fulbright Fellowship in St. Petersburg, Russia, where she focused on her specialization in Russian vocal repertoire. Fotina is a graduate of the Eastman School of Music and the Cincinnati College-Conservatory of Music.